Steps to km, steps to miles – Convert feet, miles or kilometers to steps – and vice versa. Plus, many tips for measuring your step-length and the truth about the 10,000 steps-a-day myth. Jogging, walking, striving to work, hiking or strolling: most of the time, we know the length of the walk but not the number of steps it will take to cover it. Step counters, smartwatches, and phones with special apps or wearables like “Fitbit” do a good job, but only measure the length of the route that you walked. Use this step-converter to calculate miles or kilometers into numbers of steps. Over and over, sports scientists recommend walking 10,000 steps every day. Find out here if that really makes sense, how many steps you may have already taken today, and how long the average man’s and woman’s strides are. Step or double step are units of length that used to be used almost everywhere in the past, just as the yard is still used today in Anglo-American countries. In Europe, the step was derived from the Roman gradus and was just over 74 centimeters long. That was two and a half pes, as the foot was called in Latin. With a length of 71 to 75 centimeters, the step was measured in Europe, depending on the country in which one was currently in. From the Roman passage, the double step, the mile is derived: mille passus, a thousand steps, in reality, two thousand. These measures of length were rather confusing and this explains the introduction of the decimal system, based on the meter as the basic measure. What’s the status of the step today? We are not interested in the step here as a unit of length, but as a unit of movement for the movement in everyday life, as well as for sports activities. Walking as a means of locomotion is becoming increasingly rare. Motorization, computer workstations in the home office, television, mail order and many other modern achievements have made us into movement mufflers. Studies have shown that most people walk a maximum of 6,500 steps per day. However, it can be assumed that the average is much lower. If you want to check how far you go per day, you can buy a pedometer for little money. Multiplied by your own stride length, you can convert the number of steps into meters, or better, kilometers. This also works with the steps in meters converter above. Health experts advise 10,000 steps per day, i. e. walking between six and eight kilometers per day. The advantages of walking are not all to be listed. Some of them are mentioned here: people and the environment are relieved because we do not produce any noise or exhaust fumes when we leave. For the prevention of many diseases of civilization, exercise on foot is worth its weight in gold: cardiovascular diseases, back pain due to frequent sitting, allergies, cancer or depression are avoided or alleviated. Our body is designed for movement. All our body systems, be it the cardiovascular system, metabolism or the musculoskeletal system, require physical activity to stay healthy and function. Without physical activity it is impossible. In addition, the daily steps help you lose weight, prevent obesity and many illnesses and increase your wellbeing and self-confidence. It doesn’t always have to be jogging, which strains tendons and joints. Just go get well! You can easily increase your performance and fitness and save money as often as the car stays in the garage. How can you incorporate a higher number of steps into everyday life? This is very individual and different and everyone has to look for the ideal solution that suits his or her everyday life. However, it makes sense to be physically active in everyday tasks, for example by leaving the car more often in the car for transport and walking, cycling or using public transport more often. Combine lunch breaks with a short walk or perhaps making phone calls during a walk. And of course, small changes like walking the stairs instead of taking the elevator can also be used. However, it is also important to make sure that some movement units have at least a minimum of three movements. 10 minutes or longer – this is where the greatest health benefit can be seen. Optimally, one should have 3 x 10 minutes of physical activity during the day or 1 x 30 minutes or 2 x 15 minutes etc. – this is how one reaches the general activity recommendations (World Health Organization, 2010). What do BMI do you have, check it here? The practical device known as a pedometer helps you to estimate the daily stride performance. Pedometers are also a good motivational impulse. Some devices have additional functions, such as entering the stride length, indicating the distance traveled in kilometers or functioning as a calorie counter. Of course, you can also do some of your daily steps on the fitness band in the studio. But keep in mind that exercise in the fresh air has many other positive health effects. The future? Wearables and SmartWatches! Clearly, in the future pedometers will be multifunctional and measure not only the steps and calories, but also the sleep and eating behavior, but also the heart rate when jogging or even the movements during swimming can be multifunctional. 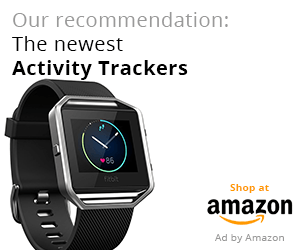 Wearables and SmartWatches are suitable for all those who want to move more in everyday life. This can be the absolute newcomer who wants to do something for his health and therefore gets off a subway station earlier on the way to work or takes the stairs instead of the elevator. But it can also be exciting for sports aces to see how active they are in everyday life. Wearables and SmartWatches, for example, allow you to record individual activities like a jogging session. Good shoes with a footbed are an important prerequisite for healthy walking. Shoes must never be too small or too tight. The toes always need sufficient space and there are different shoes that are comfortable for wide and narrow feet. It makes sense to buy shoes in the evening because your feet have expanded during the day. The optimum shoe size can be calculated here or use this chart. It doesn’t always have to be the same for health shoes, but breathable, natural materials should always be preferred when buying shoes. If you have problems with your feet, orthopedic insoles should be prescribed, which also protects the soles of your feet. The footbed should allow an even, natural rolling of the footbed, which also trains the veins and thus prevents varicose veins. Studies have shown that most people walk a maximum of 6,500 steps per day. However, health experts advise walking 10,000 steps per day, which is between six and eight kilometers per day. To achieve the general activity recommendations set by the WHO, one should have 3 x 10 minutes of physical activity during the day or 1 x 30 minutes or 2 x 15 minutes etc. The practical device known as a pedometer helps you to estimate the daily stride performance. Some are equipped to measure stride length and come with a calorie counter. Good shoes with a footbed are an important prerequisite for healthy walking. Shoes must never be too small or too tight. The toes always need sufficient space and the shoes should allow an even, natural rolling of the feet to help prevent the development of varicose veins. 3 What’s the status of the step today? 5 How can you incorporate a higher number of steps into everyday life? 7 The future? Wearables and SmartWatches!